Time for yet another contest! This time it's for those of you in Australia! In just under a month Digimon Adventure tri. 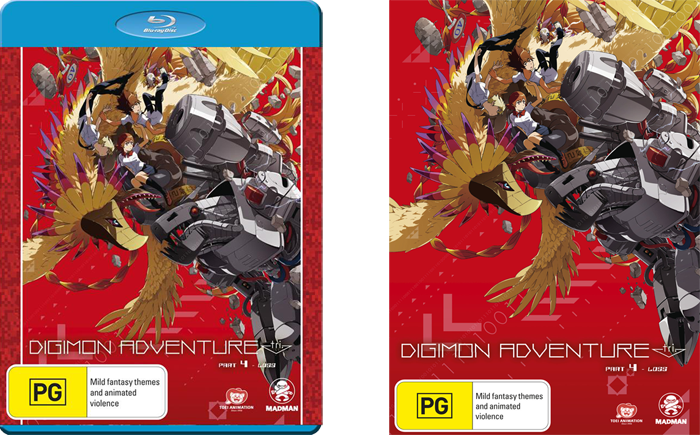 Part 4 Loss is out in Australia and we have a few copies of it to give away! You can enter either way, or both if you are feeling inspired. The winners will be chosen from a combined pool of both types of entries. The first winner can choose between the Blu-ray or DVD if they have a preference. The second winner will get the other version of the release. I won't be judging on any particular detail (or even necessarily on the quality of art or writing), just do your best. If it catches my attention you might have an advantage, but I'll be pouring over each and every entry. You don't have to send any personal information with your entry. If you win Madman Entertainment will need your contact/shipping information to get you your prize. Your entry might be shared on WtW and social media sites by us and Madman Entertainment. These contests are only open to people who live in Australia. Blu-ray and DVD courtesy of Madman Entertainment. Can I be lazy and just enter with my highlight for Chapter 2 when I mention how Mimi and how she acts in Chapter 2 and how it resonates with me? Writing is hard since I'm in a sling. Mimi’s anxiety about her own personality, and others understand the onlooking Hikari, seeing her friends in such anguish and feeling unable to do anything.Mimi’s impulsive excited nature resonates with me as it’s something I’ve always had to deal with as many people have been frustrated by this. Mimi realises that this is part of her nature, and, despite the fact her classmates are annoyed, she was actually able to motivate Meiko into doing something she enjoyed even though she wouldn’t have done it if it wasn’t for Mimi.